The emergence of Asphalt 8: Airborne totally changed the phase of mobile car racing back then in 2013. 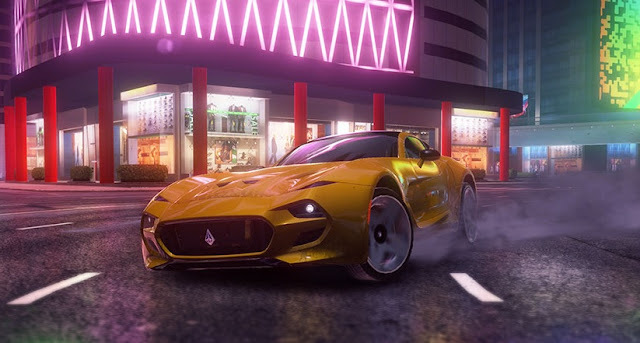 Subsequently, the table is turning yet again with the introduction of Asphalt 9: Legends just few days ago that left the fans of Asphalt series salivating on some changes made on the franchise. The developers of the latest racing game Gameloft has made quite an enterprise adjustments starting from the Bullet physics engine to new prestigious cars, new navigation system, new events and even a Nitro Shocks are which (although) had been featured slightly in Asphalt 6: Adrenaline, Asphalt 7: Heat and Asphalt 8: Airborne. The Spanish game developer has updated an extremely noticeable difference in the Asphalt 9 design and graphics. Still on the latest adjustment, there are now 48 prestigious car collection to always choose from unlike the five in the previous ones which are categorized with alphabets Class A, Class B, Class C, Class D and Class S.
Unlike the old Asphalt, all the cars now require blueprints before it can be used (unlocked). Asphalt 9 doesn’t intent to leave you lonely, players have the opportunity to join the game community of Asphalt players have opportunity to join the game community of players and also stand the chance to get rewarded. There are some peculiarities that can easily be traced to the old Asphalt series, features like the “career mode” and multiplayer mode among others which contain at least five chapters. In the newest Asphalt racing, tracks from the previous ones were also featured; tracks lines like the San Francisco and Shanghai were all very visible. The only new ones include Rome, Himalaya as and Cairo. And again some soundtracks from the previous games where also featured. It will be recalled that sometime in march 2018 when the Gameloft manager London was entertaining some questions from journalists, he was asked to comment on the development of Asphalt 9, surprisingly he disclaimed the claim by saying he is not allowed to comment on the issue. Four days after the Q and A section an official Asphalt 9 trailer was released. First was on iOS platform followed by the Android version which is available for download on google play store. On the 24th of 2018 the company took to Facebook and YouTube live stream to announce that the franchise will be released on the 26th July 2018. And there it is, exactly on the 26th of July the video game community woke up to see the latest from the Asphalt series, and from the look of things they didn’t disappoint. The Asphalt franchise has always been a boom since the first day of its first Asphalt franchise. Just like always, Asphalt 9 will continue to rock the “mobile gamespere” for a very long time. For now nobody is actually talking about an Asphalt 10; or maybe it is too early to ask, but till then lets enjoy the latest gift Gameloft has offered the mobile game fans. Lest I forget, Asphalt 9: Legends is also available on window 10. Till we meet again acknowledge the fact about video games addiction because its very visible. And check out 10 Best PPSSPP Emulator Games Ever lastly remain that gamer!